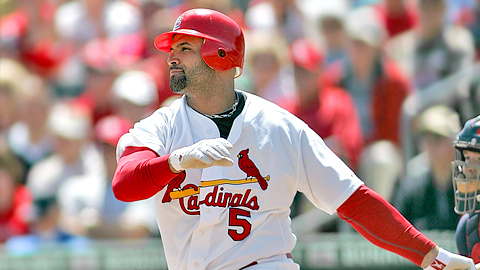 Cardinals first baseman Albert Pujols is among several Major Leaguers scheduled to attend the fourth annual Mike Coolbaugh Memorial Golf Tournament. The event, set for Nov. 19, at Canyon Springs Golf Course in San Antonio, Texas, includes a golf tournament, lunch, dinner and auctions to celebrate the life of former Minor League coach Mike Coolbaugh, who died in 2007 after being struck by a foul ball. Pujols will be joined by several current and former Major Leaguers, including Danny Graves, Boone Logan, Brooks Kieschnick, Kerry Robinson, Mike Frank and more. Coolbaugh, who played in the Majors, was the hitting coach for the Double-A Tulsa Drillers when he was fatally struck by a foul ball while coaching first base on July 22, 2007. The ball, which hit the father of two in the neck, killed him on impact, making him the only coach to ever die on the field in the history of baseball. His death brought forth a new rule in both the Majors and Minors that made helmets mandatory for coaches on the field. Coolbaugh, who was only 35 years old, left behind two young sons and a wife, Mandy, who was six months pregnant with the couple's first daughter. Mandy continues to help promote the annual golf tournament as a means of helping support the Coolbaugh family and to "support young widows and their families." The tournament is sponsored by Detechtion Technologies, Major League Baseball and Minor League Baseball. The event is described as "a 'Celebration of Life' to remember and honor the amazing man that Mike was. While Mike's life ended on the baseball field, his legacy has only just begun. Mike's passion for life continues to inspire people across the country and this tournament is a testament to his young children of the lovable man that Mike was."